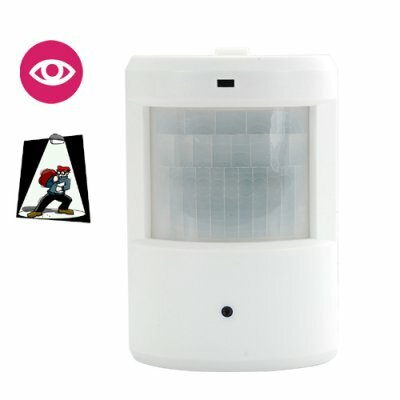 Successfully Added Wall Surveillance Camera with Sony CCD Lens + IR Light to your Shopping Cart. Cool Video Camera that is completely disguised as a corner wall light sensor. Utilizing a micro Sony CCD 3.7mm pin hole lens and (IR) Infrared capability, this is one sneaky hidden videocamera! This is a great way to monitor your property without anyone being the wiser and comes with (IR) Infrared technology that allows for monitoring even in low light conditions. This discreetly sized wall mounted security recording system with infrared is the perfect way to catch those that intend to do harm. The lens can capture a viewing angle from 0 - 45 degrees, making this gadget perfect for mounting on the corners of rooms, offices, corridors and stairwells. Almost every house, apartment, business or retail shop has a light sensor these days. That's why no one will ever question the presence of this new wall mounted camera detector. Little do they know there is a hidden CCD video camera inside! Cleverly concealed inside a wall mounted light sensor, this full color covert camera is perfect for all your secret surveillance needs. The CVLF-I30 makes a great addition to any home or business security system, this Sony CCD disguise camera will easily attach to any wall and blend in for great covert surveillance. Orders yours today, and we will ship it out tomorrow, this excellent home and security surveillance gadget is available for single and bulk purchases straight from the leader in factory direct wholesale electronics, Chinavasion. Note: This model is used only for video surveillance. Anyone ordering this device should only be ordering for this purpose since MANY COUNTRIES STRICTLY PROHIBIT OWNERSHIP OF DEVICES. This product shows audio out, alarm out and MIC, does that mean it can record audio and you can connect it to an alarm system? No, this model can only be used for video surveillance, the Audio out, MIC and Alarm feature have not been activated yet. Please keep visiting our new products page [ http://www.chinavasion.com/products_new.php ] as we constantly add new products everyday. on 2010-05-12 23:16:16 Great product in it's pricerange! Good camera with excellent low light image quality. Connecting it to a PC was no problem at all.